I discovered Yes music in 1972 (at the age of twelve) when my older sister brought home a copy of Fragile. Looking at the sleeve design, the booklet, the lyrics, this all made me a little curious so I put it on the turntable and gave it a spin, WOW! This was to be the start of a journey with Yes that continues to this day. I immediately went about collecting the early albums (which at the time was up to CTTE), and every album following on release. And then, to finally see them live for the first time on the Relayer tour was absolutely fantastic (I also saw them at Reading festival later in the year). Now a veteran of around twenty Yes gigs, I must say that this show stands up with the best. The superb capital theatre venue was jampacked and immediately on hearing the opening notes of 'firebird' the whole place erupted. With soundchaser as the new opener, the stage set, the lighting, and with the 20-minute epics CTTE, TGOD and Ritual scattered amongst the set-list, Yes (even without Mr W) were laying down a marker to all, their complexity and quality of musicianship was un-matched in the live arena. My first Yes show, still the best gig I've ever been to and the best Friday night of my life! (even without Rick). I was 16 and with a bunch of school friends. About 6 weeks previously we'ed queued all night for our tickets. The box office was due to open at 10 AM on a Sunday but they opened at 08.30 on the advice of the police as the queue was a few thousand strong and growing fast. When they opened the box office bedlam ensued! We got our tickets, those who turned up later had no chance. At the gig Gryphon opened and were good. Then, at the first strains of Firbird Suite everyone rose and roared their approval. As the guys came on the stage there was a great surge to the front and those of us a little further back stood on our seats. And that is where everyone stayed for the whole show, the place was bouncing. The Capitol, now demolished, held over 2,500 and the balcony was literally shaking through the whole gig. The atmosphere was absolutley electric! I came away with an Alan White "Ludwig" drum stick (which I still have) and a smug expression on my face as those in my group of friends who had seen Genesis two days earlier in Bristol freely admitted that Yes were in a different class. 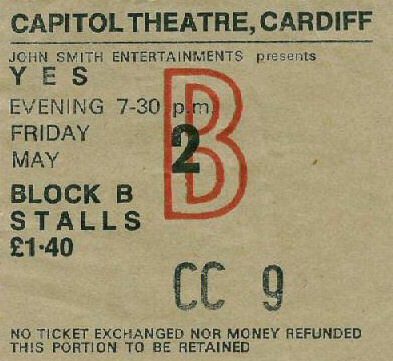 Three of us had been wise and purchased a second Yes ticket for the Bristol show on the following Wednesday.